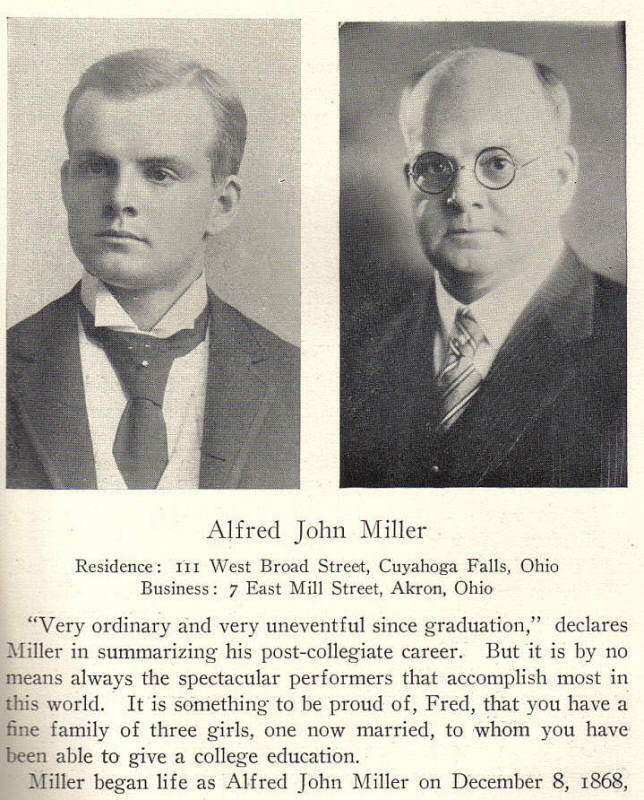 Comments: Alfred John Miller (Nee: ) | Cuyahoga Falls OH USA | 1921-1940 | Comments: b: Dec 8, 1868 Doylestown, OH to Samuel H and Ella H. Miller. Married Harriet L Funk, Nov 18, 1897 at Wooster Oh . She died Mar 26, 1918 Three daughters, Miriam, Ethel R. and Harriet E. Born between Nov 26, 1898 & March 24, 1903 ///This is the 33rd Year Reunion Yearbook of the Class of 1892 Cornell University Ithaca, NY. To see all the records posted click below. The Archive does not have any information beyond what is mentioned in the record. Only photo entries of the yearbook have been posted. If you would like to leave a Note in this record contact webmaster@deadfred.com place in the subject line "1892 Cornell - Note"